Lone worker alarm systems provide employees who work alone with a way to signal for help in an emergency. The alarm is usually triggered on a smartphone or device, and is sent to an external monitoring station, employer or emergency services. What are the different types of lone worker alarms? The most common type of lone worker alarm is the panic alert. Panic alerts are usually triggered by an easily accessible button on a device or smartphone. Lone worker panic alarms are suitable for use following an accident, disaster or when a lone worker is made to feel at risk and assistance is required. Discreet panic alarms allow lone workers to trigger a panic out of view. Discreet alerts are usually performed by pressing the phone’s power button, shaking the device, or through a discreet, wearable button. Discreet alarms are suitable for lone workers who are made to feel uncomfortable or threatened by another individual and do not want to aggravate the situation by being seen to trigger a panic alarm. Duress alarms are used to appear as though an alert has been ended when confronted by an attacker. This is usually carried out by entering a false PIN which will appear as though an alert has been cancelled when in fact a Duress alert will have been sent. A Duress PIN can also be entered on a lone worker app to appear as though a tracked session has been ended. Man-down alerts are used to detect accidents or medical emergencies which may prevent the lone worker from being able to trigger a panic themselves. The lone worker app or device will detect a period of non-movement and send an alert to the monitor. This type of alert would be suitable for anyone working on a site where they are moving around regularly. Some lone worker devices will detect a fall by recognising the quick motion of the device followed by an impact. The sensitivity of the trigger will depend on the configuration of the device itself. Why do I need a lone worker alarm system? Every employer has a legal responsibility to ensure the safety of their employees. If your employees, however, work away from colleagues and direct supervision, knowing when something goes wrong and following steps to protect them, can prove difficult. Lone worker alarms allow the lone worker to raise an alarm when there is no one around to offer support. Having a range of alerts keeps your lone workers protected in a range of situations – allowing you to meet your duty of care while providing them with confidence – knowing their safety is being looked after. StaySafe understands the range of challenges lone workers face and offer all of the lone worker alarms listed above. 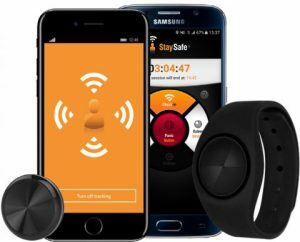 Panic, discreet, duress and non-movement alerts are available on our smartphone app, while a wearable Bluetooth button offers an additional panic, discreet and man-down alerts. To find out more about StaySafe’s lone worker alarms, visit our lone worker solution page. StaySafe provides app-based workplace safety solutions to organisations around the world. Our easy to use solutions help protect the lives of employees within major corporations and small businesses alike, across any industry and over five continents. 2019 Safe Apps Ltd. All rights reserved.